Facing multiple warrants, Corey W. Paradise eludes authorities in dramatic fashion, reminiscent of a similar chase in 2014. 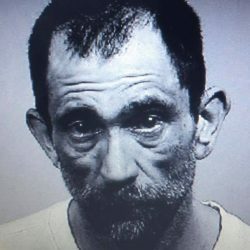 Authorities in York are searching for a habitual offender who eluded capture Saturday morning after police used Tasers on him – jumping out a window at a construction site and fleeing barefoot into the woods in the midst of a thunderstorm. Corey W. Paradise, 45, was still at large Saturday night, York police said. It’s not the first time Paradise has made the news with extraordinary efforts to elude arrest. In 2014, he led police on a long, bizarre chase when Scarborough police tried to pull him over for having a headlight out. On Saturday, a York police officer on patrol spotted Paradise driving a car and knew he was wanted on multiple outstanding arrest warrants. While the officer looked up the records, Paradise drove out of sight, according to a police statement. Officers found the car in the parking lot of a construction site off Long Sands Road at the York Housing Authority complex and they located Paradise inside a building under construction. There, Paradise resisted the officers and tried to flee, and the officers used their Tasers on him. But Paradise was able to jump out a window and fled into a heavily wooded area behind the plaza, police said. Late Saturday, police said they believed Paradise was picked up in York and may have been sighted in the Sanford area. Police asked anyone who spots Paradise to call them at 363-4444 and not to approach him. In the 2014 chase, Paradise, then of Gorham, pretended to be pulling over when the officer turned on his lights. But Paradise instead rolled slowly through the Cabela’s plaza parking lot, onto the Maine Turnpike entrance ramp – threw a U-turn, then another – went through the tollbooth without stopping and headed north, according to police. He’d hit several orange traffic cones and one got caught under his car, so it was smoking as he drove at speeds up to 80 mph, swerving and at one point throwing out a beverage container that broke on the cruiser behind him. He got off the turnpike in Portland then led police on an alternately slow- and high-speed chase through multiple neighborhoods before abandoning the car. Police found him hiding under the porch of a house and he scuffled with officers during the arrest – leading to more charges. Paradise is currently wanted on multiple arrest warrants, including failure to submit to arrest, reckless conduct, unlawful possession of scheduled drugs, operating a motor vehicle after habitual offender revocation, violating conditions of release, and failure to provide correct name or address.